Dr. Graham received his Bachelor’s in Civil engineering from Queen’s University (Belfast). He subsequently completed a PhD in Soil Mechanics and a Doctor of Science in Geotechnical Engineering at the same university. He has had a stellar teaching career at a number of highly respected institutions around the world. These include his Alma Mater, Queen’s University, the Norwegian Geotechnical Institute, the Royal Military College (Kingston), Oxford University UK, The University of Queensland (Brisbane), and the Nanyang Technical Institute (Singapore). He is currently Professor at the University of Manitoba, and has been for the last almost three decades when not being shared by other institutes, universities and engineering companies. Dr. Jim Graham is a very well traveled, busy and highly respected Professor and Research Engineer. For such work he has won a number of awards including the Hill Sanderson Award for teaching, the CCPE Medal for Distinction, and the prestigious Legget medal of the CGS. I would remind the audience that the Stirling medal of the EIC is awarded primarily for distinguished service at the national level within the EIC and/or its member societies. Let’s concentrate on this for a moment, in Dr. Graham’s career, for he happens to be one of these charismatic and enthusiastic individuals who people simply want to support. He is currently Director General of the CGS, where his work involves guiding the programs of a very active and diversified technical society with almost 1300 members in Canada and overseas. There are seven technical divisions, and local chapters in 20 Canadian cities. 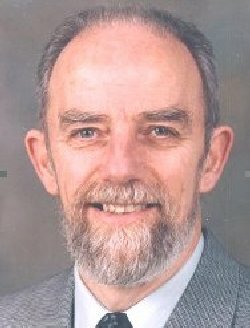 In earlier days Dr. Graham was Editor of the Journal of this society, where he broadened its area of interest into environmental geotechnology, geohydrology, rock engineering and geostatics. Then, following a period as Vice-President he became President of CGS, where he pursued a policy of “participation, rejuvenation, education, and communication”. The program was aimed at increasing the involvement of students and young engineers, and included student competitions for best theses and papers. Special conferences for such developing talent have grown directly from his efforts. His work and attention on young people is, as you might expect – very compatible with his buoyant personality. The CGS, the EIC, and Canada are fortunate to have the interests of such a person directed .at the upcoming generation. That is just a snapshot, Ladies and Gentlemen, of Dr. Graham’s principal current interests. The EIC is pleased to recognize the outstanding talents of this engineer, and award him tonight, the prestigious John B. Stirling Medal.